We know you have many choices for water heater specialists in the Inland Empire, so we strive to provide you with exceptional quality and customer service. Our experienced team of licensed, insured, and professional contractors will work efficiently to fully repair your water heater in a timely manner for a fair price. We make sure that we are reliable, knowledgeable, and prepared for every job, so you can have peace of mind. We are a locally owned and operated business. Just like you, we love the Inland Empire and its residents, so we are proud to serve you and will do everything we can to give you a hassle-free experience. For all of your water heater needs, call our Inland Empire, Temecula, Murrieta or other service locations today. When we say customer service is our top priority, we mean it. We aim to make every experience you have with ProFlo as pleasant as possible. Whatever the problem with your water heater is, we’ll be there to fix it for you right away. Our team is always prompt, reliable, knowledgeable, and courteous because your home means as much to us as it does to you. When emergency strikes, call ProFlo. Day or night, Monday through Sunday, we’ll be there for your water heater emergencies 24/7. No problem is too big or too small. Give us a call at any time of day, and we’ll send one of our experienced contractors out to your home to address the problem immediately. Nothing’s worse than a cold shower on a cold morning. When your water heater needs a repair or replacement, call the company that will be there for you 24/7. Here at ProFlo, we’ve been serving the Inland Empire community for over 15 years and have been providing premium plumbing services. We can assist you with all of your water heater needs including installation, leak repair, valve replacement, and scheduled maintenance. If your water heater starts to give you trouble, give us a call right away. When you need a brand new water heater installed in your home, go to the professionals you can trust. ProFlo has a team of reliable, experienced contractors who’ll provide you with quick, hassle-free installation alongside top-notch customer service. We’ll deliver and install your chosen water heater, and haul away your old unit in a timely manner. We’ll then test your unit to make sure it’s working properly and familiarize you with your water heater so that you can feel comfortable handling any problems if they should arise. Whether it’s a fresh installation or an old unit replacement, call ProFlo for more information on available water heaters today. Like many household appliances, your water heater requires regularly scheduled maintenance in order to extend its life and keep it in top shape. To prevent unexpected leaks and other larger issues that may require costly repairs, establish an annual maintenance schedule. During your annual maintenance check, we’ll assess all of your unit’s valves to make sure there’s no corrosion or malfunctioning parts. We’ll then drain your water heater to flush out any sediment, inspect it for any rust or other damage, and then refill it. If there are any issues we notice with your unit, we’ll repair them on the spot to prevent larger problems that could cause property damage. We offer scheduled maintenance programs at a competitive market price, so don’t hesitate to give us a call here at ProFlo. 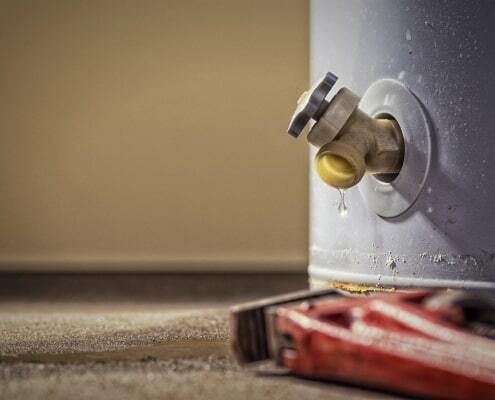 A water heater leak can be a sign of a wide range of problems. Although it’s often a small problem with a quick fix, it can also be a larger problem with the potential to cause major damage to your home if not properly treated. To avoid total appliance failure, contact ProFlo as soon you notice a leak from your water heater. One of our knowledgeable contractors will promptly diagnose the problem, check for other leaks using the latest leak detection technology, and make the necessary repairs to keep you and your family safe and happy. There are two main valves in your water heater – the temperature and pressure relief valve and the pressure reducing valve. The former controls water temperature so that it does not exceed 210° while the latter reduces the water pressure in cities where the water supply main’s pressure exceeds 80psi. 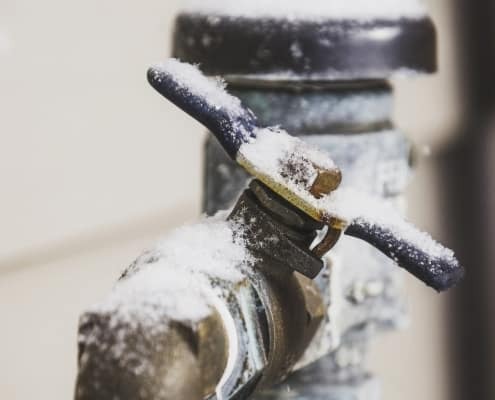 If either of these valves malfunction, it’s crucial that you have them replaced so that you and your family can continue to safely enjoy your home’s hot water. If you experience higher than usual water pressure, rattling pipes, a leaking relief valve, or other unusual behavior, call ProFlo for a timely assessment and repair. Just like a standard water heater, a tankless water heater requires regular maintenance to keep things running smoothly. Your tankless heater should be flushed and cleaned at least once a year — even more often if you have hard water — in order to remove calcium and other minerals from the unit that may cause damage over time if allowed to build up. To flush your tankless water heater, we cut off power to the unit, remove buildup by pumping in and circulating a sanitizing agent, and remove sediment from your inlet filter screen before reinstalling and reconnecting all components. We will also inspect your unit for leaks and other signs of damage so that we can repair any minor problems before they become a larger risk to your home. The process only takes a couple of hours, but it can extend the life of your tankless water heater for years if a proper maintenance schedule is adhered to. The thermocouple, present in almost all pre-2012 gas water heaters, essentially keeps your unit’s pilot lit. The thermocouple is intended as a safety component in your water heater that, in case of a pilot light failure, closes off the gas line to prevent the combustion chamber from flooding with unburned gas. When your thermocouple is malfunctioning, your pilot light won’t stay lit, which will result in a lack of hot water for your home. The tip of a thermocouple naturally deteriorates over time, so regularly scheduled maintenance and an occasional thermocouple replacement is necessary to extend the life of your water heater unit and avoid complete unit replacement. If you’re having trouble keeping your pilot lit, call ProFlo today and we’ll schedule a thermocouple replacement at your earliest convenience.